5 Minutes to Ski Runs, Family Friendly Resort. 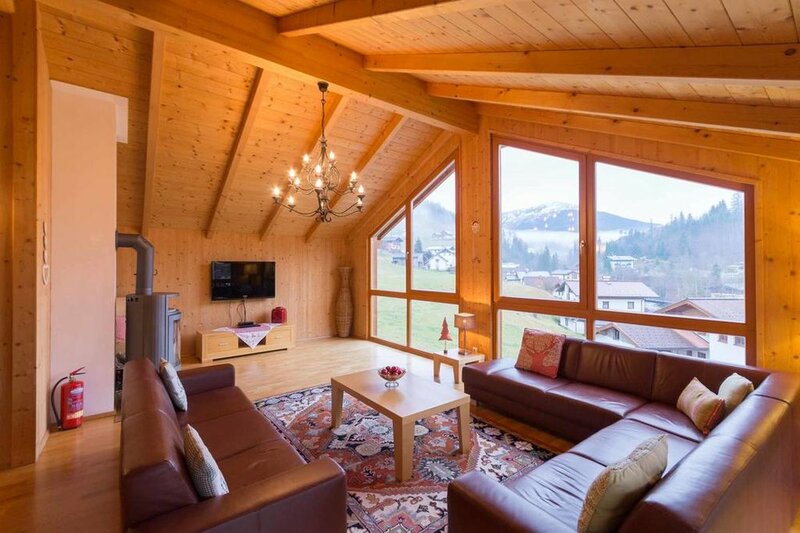 Skiblickhaus Chalet - Fabulous luxury accommodation picturesque hamlet of Russbach in the Dachstein West Ski region (140km piste). 1 hour south from Salsburg. Great skiing via tree lined pistes or summer hiking, walking or Summer skiing on the Dachstein Glacier. Relax and don't worry about your Ski gear. We have a FREE heated Ski locker facility at the cable car station to store boots and skis overnight to avoid walking home in them. Ideal for families and couples. Free daytime child care for toddlers and infants in resort allows parents, with small kids, some free time on the slopes. Relax in the sauna after a days exertions then curl up on a Persian rug in front of the log fire. The village has unspoilt traditional Gasthof's, a bank, supermarket, village store and tourist info office. Russbach is linked to Gosau and Annaberg and you can ski between the 3 villages. Lots of mountain top "hutte" provide music, food and drink. In summer the cable car has a "kiddies/adults toy train" which takes you from the top to a mountain restaurant. There is also a natural water park, with slides into the pool, plus a cafe.